Spinal muscular atrophy (SMA) is a rare autosomal recessive disease, characterized by progressive degeneration of muscular motor neurons. SMA has a prevalence of 1-2 per 100,000 persons and an incidence of 1 in 10,000 live births. Heterogeneity of symptoms in SMA, making the diagnosis and treatment challenging to the clinicians. Epidemiological estimates for SMA are also hindered by underdiagnosis and misdiagnosis resulting from insufficient disease awareness and a clinical presentation involving non-specific clinical features that are hallmarks of more common diseases. There is a need to understand the different types of symptoms and disease severity to identify SMA and to provide a comprehensive estimate of SMA prevalence. It is a daunting and tedious task to exhaustively identify all possible disease outcomes and then identify articles that discuss disease-related outcomes. This process is even more challenging for rare diseases, such as SMA. Causaly is a machine-reading platform that can help capture all possible disease outcomes and provide the evidence within seconds. We ran the preliminary Advanced Search in Causaly to gain a broader understanding of the different disorders associated with SMA. 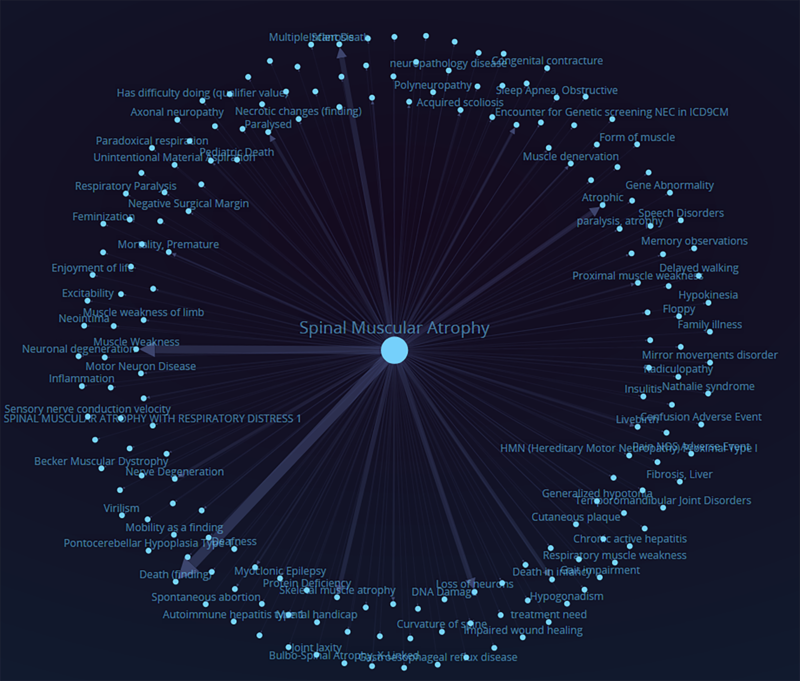 Running a simplified search with “Spinal Muscular Atrophy” provided a dendrogram and a list of articles in less than 2 seconds. The dendrogram provides an overview of all concepts associated with SMA in the published literature. 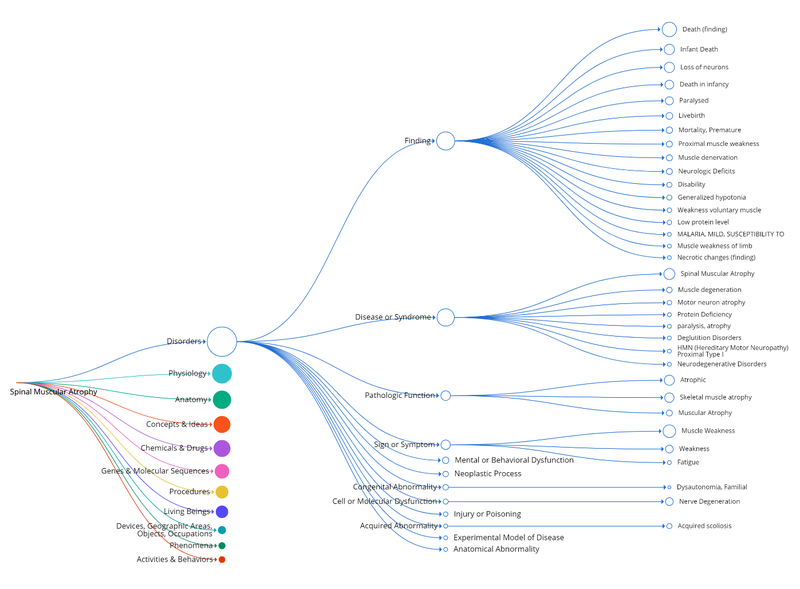 Clicking on any node of the dendrogram provides a list of articles that mention the specified concept or symptom. Figure 1. Exploring clinical concepts, especially disorders and symptoms, underlying SMA. The algorithm resulted in 1,000 relationships in less than 10 seconds. The relationships indicate both physical symptomology as well as psychological conditions associated with SMA. The resulting graph provides insights into the complexity of SMA and provides an overview of the amount of evidence available for each symptom. Wider connecting lines indicate that there is more evidence that establishes the relationship between two entities e.g. SMA and neuronal degeneration is established in 331 academic publications. provides 194 evidentiary articles that discuss different types of muscle degeneration associated with SMA (Figure 3). This platform provides a flexible approach to understanding relationship between two entities. Causaly is a valuable tool to identify underdiagnosed and misdiagnosed cases, especially in rare diseases. The results from these searches can help both clinicians and epidemiologists in reporting and understanding the evidence and providing a more comprehensive picture of disease prevalence across the globe. 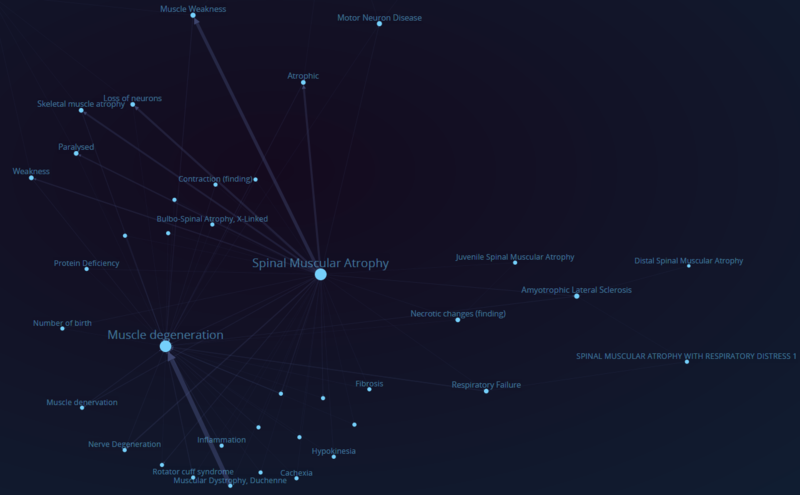 Causaly is an easy-to-use tool to identify possible concepts related to a health condition. Using the results from Causaly can help improve the sensitivity and specificity of the searches performed in Medline/PubMed, EMBASE and other search platforms. There is much to explore with the platform to gain a deeper understanding of the evidence generated by machine-reading platform! Avijeet is an expert in Market Access and Health Economics and Outcomes Research helping patients and providers increase their knowledge and understanding of the opportunities and challenges of maximizing healthcare value to improve health and quality-of-life.